Lincoln artists Byron Anway and Jordan Buschur must love a good crowd. Each focuses on the psychological and compositional possibilities of volumetric quantities, whether of people or things. Mass In, an exhibition of their recent paintings, is now on view at the Nebraska Arts Council’s Fred Simon Gallery through March 4. 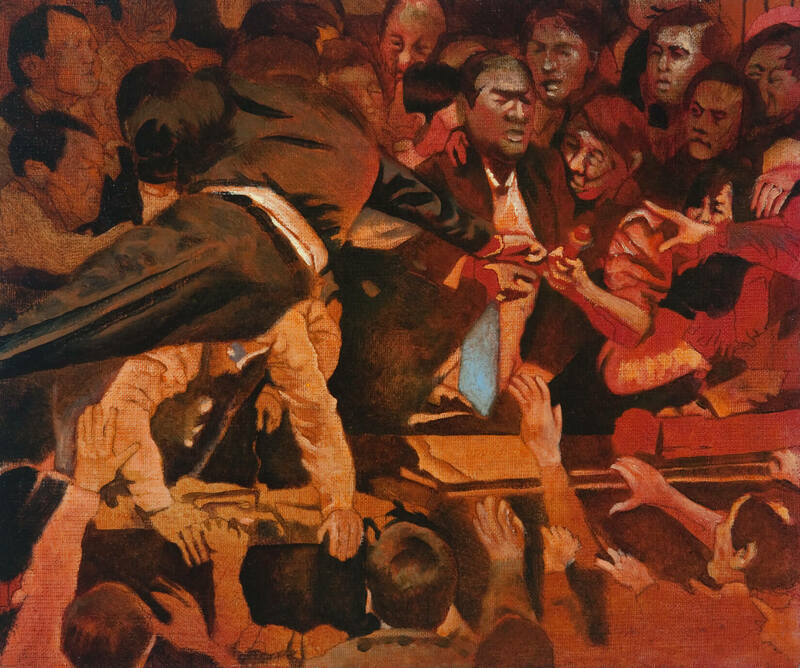 Anway’s subject matter draws on crowd dynamics, with paintings and watercolors inspired by the multitudes captured in news footage and through social media posts at such places as concerts, sporting events and protests. There, people gather to express usually common passions, whether for important issues of cultural change or more frivolous indulgences of celebrity sightings. Such crowds, of course, may be distinguished for their civility, as suggested by two large watercolors in the front gallery. “Event 1” and “Event 2” are drone’s-eye-views of large assemblies of people, as you might see at arena concerts and outdoor music festivals. They appear to be looking and listening, rather than playing or marching. Only in “Event 2” do you see in the lower left two groups gathered around some sort of opening. Are they dancing in a circle? Setting up for blanket toss? Anway makes small distinctions among the otherwise heterogeneous figures in this sea of humanity, including shifts in body position, clothing color and hairline. Truly, they are reduced to colorful, interlocking ciphers making up a large, overall composition that conveys energy and density. Any attempt to find a recognizable face is a useless exercise in playing “Where’s Waldo?” Another thing that sets the scene apart from reportage: see any evidence of cell phones? Anway’s two other solo contributions take on crowd dynamics in micro. Both “Ukraine” and “Fight” appear to be inspired by the melees that sometimes result among otherwise thoughtful people. The Ukrainian legislative body is especially famous for its brawls, which have become stock entertainment footage in the West. Here, men in suits and shirtsleeves push and shove; Anway’s close-up view compresses the action into a tight, tense space. In “Fight” a body hurtling into the scene from the left could just as easily be a crowd surfer, were this the mosh pit at a concert. It underscores Anway’s observation that there is often little visual difference in crowd behavior between mob scenes and groups gathered outside morning shows or rabid fans at sporting events. Anway also creates a greater sense of character in these last two paintings, as facial expression and distinct body language are more legible. This mood aligns them with historic American social realist painting; yet with election rhetoric now in full swing, they also read as very timely evocations of Capitol Hill gridlock and other forms of political gamesmanship. Broad portraiture with a different psychological resonance is embedded in the paintings by Buschur. An artist who came to still-life painting through representational work, she has been challenging herself to create compositional arrangements depicting ordinary objects belonging to family and friends. Three Buschur paintings in the exhibition’s front room look down into the contents of desk drawers. Open the average center drawer and you’d find an assortment of useful items, such as pens, pencils and scissors, as well as the lost and forgotten, including dried up glue sticks, cracked rubber bands and old receipts. You may also find a random assortment of snapshots, ticket stubs, travel souvenirs and other personal mementos. Despite her sources, Buschur has made all the drawer contents truly anonymous. Not so much as a brand name appears, and with the flattened perspective, it is even difficult to suss out what office supplies you may be looking at. While expressing an interest in exploring the “weight of material things” through her paintings, Buschur really lets the viewer take over the heavy lifting, sorting through these items for reflected meaning. Stepping back further from the representations and their veil of psychological resonance, the viewer can also discover formal pictorial constructions of line and color with strong vertical and diagonal motion that address the dynamics of many similar things within a constrained space—much in the same way as Anway’s “Event” paintings on the opposite wall. Three additional paintings feature still-life compositions of open, empty boxes—Buschur considers these counterpoints to the full drawers, drained of their connection with contents or their owners. Rectangular geometries are at play here, as are perspective and shadow. Her palette is rather neutral; the view is close-cropped; highlights on box edges keep the eye in motion. As with Buschur’s drawer paintings, the box works hover between eliciting the personal (what might they have contained?) and being pleasant foils for artful play on the canvas. Rounding out the show are the three tiny panel paintings that mark a collaboration between the two artists, who passed each work between them several times in an organic process of image building and editing. Each work features a different silhouette—male head, female head and a hand—colorful geometric designs and incised electronic diagrams. They share with the other paintings a compressed space and expansive energy, as well as the delicate friction between context and invention that characterizes the artwork of each. Mass In continues at the Fred Simon Gallery through March 4, 2016. This Nebraska Arts Council gallery is located on the lower level of the Burlington Building, 1004 Farnam Street and is open Mon-Fri from 8am-5pm.